The expanse of grassland can make the tour experience more colorful. This place offers views of green hills and valleys, filled with tropical trees and beautiful natural rice fields with a comfortable jogging track area. If you depart from Legian Kuta, it takes about 1 hour 30 minutes to travel by car. Ubud Love Hill "Bukit Cinta Ubud" has a jogging track that can only be traveled on foot or by bicycle, because there are several steps that must be passed before heading to this area. This peaceful hills, one of Bali's instagramable and worthy tourist destinations is "Bukit Campuhan Ubud". The Love Hill is also flanked by 2 tributaries, so it creates a view of the valleys with a grove of tropical trees, from a distance seen a stretch of rice fields and a collection of palm trees beautifully presented, in other parts also seen a number of hotels and villas on cliffs Hill. 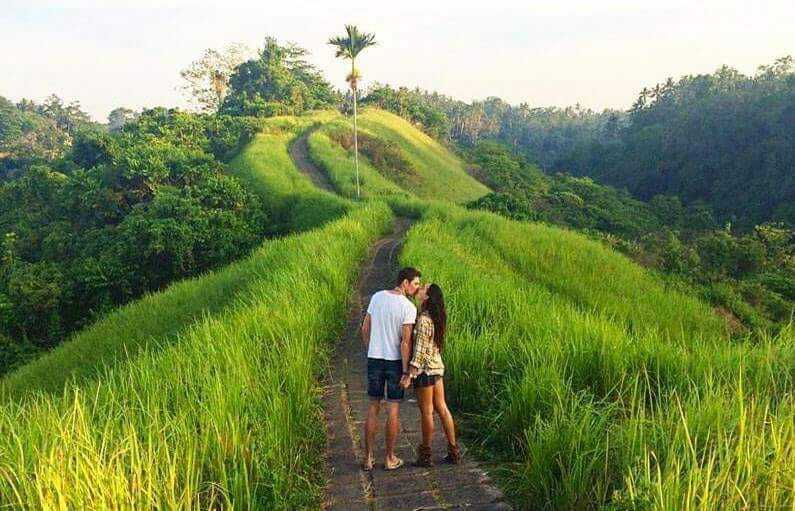 Mount Lebah Hill and by foreign tourists are better known by the name Campuhan Ridge Walk, indeed there are many versions of the name for this tourist attraction, maybe because there is no sign on the tourist attractions in Ubud. The best time to walk the jogging track on Campuhan Hill in Ubud is in the morning or evening, because during the day the sun is quite hot and in this location there are not many places to shelter. Capturing an impressive memory in this place will be something very valuable in your life. and enjoy your beautiful day.